The Surf House is in a laid-back coastline village called Dulan (都蘭) originally a fishing and farming village with a large indigenous population. Over the years some Taiwanese and foreigners have made this laid-back place their home, creating a vibrant and colorful community of surfers, artists, wood-workers, eco-farmers and other lost souls. On the weekends and holidays there are live music venues, handicrafts markets and a microbrewery selling their homemade beer. Everything the village has to offer is within walking distance (convenience stores, restaurants, bars, cafe’s, tea shops, atm, pharmacy, post office). Within short rides there are numerous colorful temples to visit, bustling festivals to attend and huge variety of local foods for you to discover. Besides that there is stunning tropical nature offering hiking trails, waterfalls, deep valleys and much more. One of the best things about Taiwan is undisputed the friendly, generous and helpful people living here and you might end up chatting with random persons on the street and be invited to snacks or even share a beer or two. There are 2 international airports in Taiwan and you have several options to come to us. Tipp: Kaohsiung airport is smaller than the one in Taipei, with shorter immigration lines and a quick check-in/out! By airplane: most international flights will land at Taoyuan airport (TPE). From there you have to transfer to Songshan (TSA) airport and hop on the domestic flight to Taitung with Uni Air or Mandarin Airlines. These airlines will transport your board for free. By train: From Taoyuan airport take the MRT to Taipei main station, change to the train gates. The fastest trains to Taitung are called Puyuma and it is about a 4 hours ride. If you want to bring your own board you will have to go to Songshan Station and ship it from there. We strongly recommend flying! By train: From the aiport take the MRT to Kaohsiung (KHH) main station (30min). 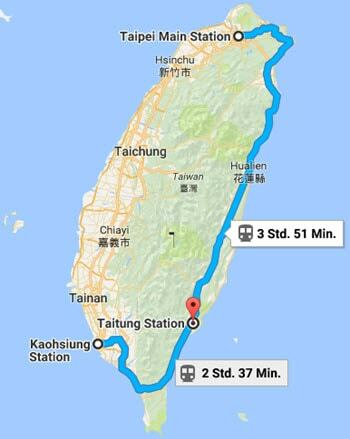 The train takes about 2,5 hours to arrive in Taitung and stops quite frequently. It is a good occasion to see a beautiful part of Taiwan and already check the waves. If you book the guided surf package with us for at least 6 nights we will come to the train station/airport and pick you up in person. Just a bit south of latitude 23°, Dulan has a tropical monsoon climate. From March to November the there is plenty of sunshine, with constant hot temperatures in summer time. During Winter (December to February) it can still be pleasant weather but normally it’s windier and not the best time for sun seekers.